Here at Eco Roofing, we pride ourselves on providing our clients with the best service in the area. With our team of qualified and expert roofers and state-of-the-art equipment, we have the knowledge and understanding in all aspects of roofing. The materials which we use are designed to last and are guaranteed to last for up to 25 years. Using zinc to complete your roofing project can be more beneficial than you think, a zinc roof is extremely corrosion resistant and also offers further advantages compared to other metal roofs. The zinc we use to complete your roof has a low maintenance care regime, even in a harsh site that is exposed to spray and wind, we can install it and you can forget about taking care of it. It practically takes care of itself, it really is that simple. Zinc is entirely recyclable, meaning when it is recycled it can conserve at least 95% of the initial energy content of the metal. When reaching the end of its lifespan, the material can be recycled without causing loss of properties and degradation. With our professional roofers, we are able to form various shapes in order to fit your roofs requirements, whether you need a large roof fitted or a shed roof replacing with a much more efficient material, just give us a call. Here at Eco Roofing, we use sheets of zinc which are between 0.7 and 0.8 of a millimetre thick. this allows the material to be strong and flexible whilst still remaining light enough not to put any unnecessary strain on the structure it is applied to. There are multiple different finishes to choose from, natural zinc is much cheaper as it is the only zinc product we install which hasn’t been treated. We also supply pre-weathered zinc which ranges in shades of grey including graphite and anthracite. Finally we also supply bio-lacquered zincs; these are bright bold colours which can make the dullest of buildings stand out. If you are looking for affordable zinc roofing in , then Eco Roofing is a crucial place to call. With our competitive rates and honest prices, you can be sure to get amazing value for your money. As well as amazing value, the service we provide to our clients is professional throughout. If you would like to find out more information regarding the zinc roofing services we provide in , please don’t hesitate to get in touch today by calling 0208 657 7725. Do you want zinc roofing in Surrey? Could you benefit from copper roofing in Sussex? For a wide range of roofing solutions, make your first call to the professional and reliable team here at Eco Roofing. Single lock: Single locking panels are often used for fascia panels and or soffit panels, the sides of dormers are also commonly single locking panels. Roof Pitch: Standing seam sheeting needs to be laid to a pitch the minimum requirement being 3 degrees if you are considering having a zinc or copper roof with less of a pitch then you will have to opt for a 'Batten Roll' roof. Batten Roll Cap: Batten roll roofing is usually required when installing flat roofs or roofs under a 3 degree pitch although can be used for any surface weather it be flat, vertical or even soffit. 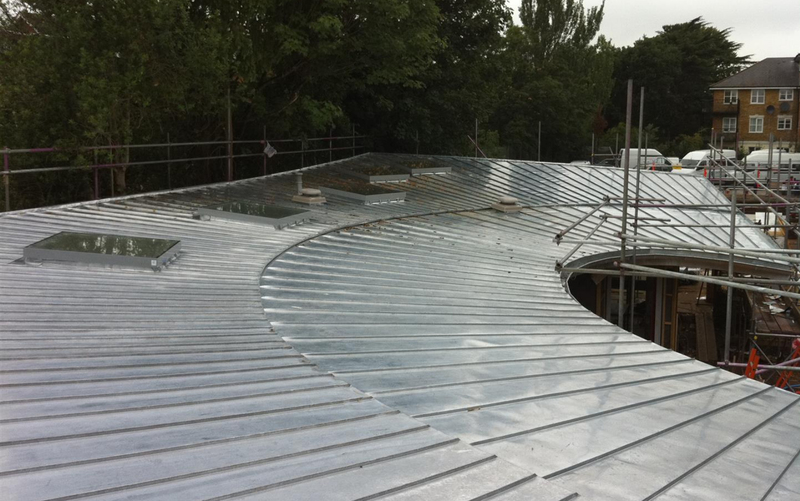 Standing Seam: Standing seam sheeting is the most common practice carried out in the zinc and copper industry today. It uses the same basic princables as traditional standing seam roofing which was made by hand in small sections but the modern methods involve profiling machinary which will run a sheet as long as is required.